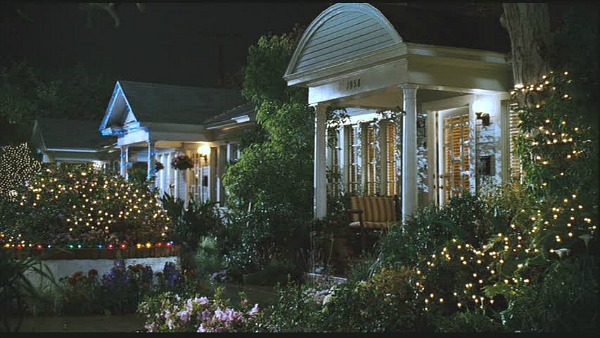 The Bungalow Court Featured in "Alvin and the Chipmunks"
Songwriter Dave Seville (Jason Lee) lives in this bungalow so charming that it provides some much-appreciated eye candy for the moms and dads watching the movie with their kids. This project now provides 16 homes to formerly homeless individuals and households living with disabilities. St. Andrews Bungalow Court is listed on the National Register of Historic Places and has received numerous renovation awards, including a 1996 Preservation Design Award from the California Preservation Foundation. 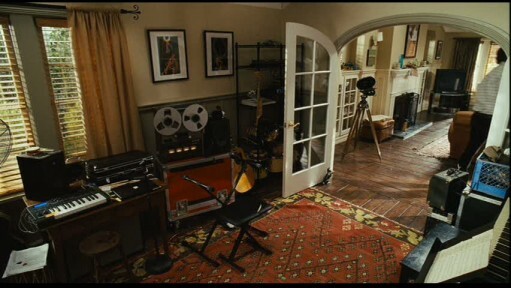 “The entire interior and walkway in front of the house was built on a soundstage at Sunset-Gower Studios in Hollywood. The director, Tim Hill, did a great job of mixing the exteriors shot at the apartment complex with the footage shot on stage. “The Chipmunk Song” (sometimes called “Christmas Don’t Be Late”) was written by Ross Bagdasarian, Sr. (a.k.a. David Seville) in 1958. It was also performed by Bagdasarian. It hit #1 on the Billboard Pop Hit Singles chart and sold more than 4.5 million copies. With the release and popularity of the film Alvin and the Chipmunks in December 2007, “The Chipmunk Song” re-entered the Billboard Hot 100 at #70. At the same time, a remixed version of the song that appears on the Chipmunks’ 2007 album (and soundtrack to the film) Alvin and the Chipmunks: Original Motion Picture Soundtrack, peaked at #66 and was credited as “The Chipmunk Song (Christmas Don’t Be Late) (2007 Version)”. Since I wrote about this bungalow court, a lot of you have asked me if it’s the same as the one from the Goldie Hawn movie Swing Shift. I looked into it and wrote about those bungalows here. Neat!! I haven’t seen the movie, but I’ll be sure to go buy it now!!! .-= Nancy Hood´s last blog ..The Tide Rolls =-. I happened upon your website last night and looked through all the available houses. My first thought was, she needs to post the Alvin and the Chipmunks house and then was thrilled to see that it was coming soon. This is one of the cutest cottages I have ever seen. I could easily live in something like this (minus my kids of course). I have made my daughter watch the movie multiple times, just so I can see the house. I googled the “squeakquel” and it appears that the house is featured again. Something tells me I’m not going to be able to drag my daughter to the movie theater to watch it. I guess I need to rent some kids. LOVE the house! Thanks for posting all of the pics! .-= Karla´s last blog ..It’s Almost Time… =-. That would be “house”…not “hose”…that caught my attention! Oh, you are just too much! This was a wonderful post. I haven’t seen the movie either and would love to. I think I was in the second grade when the Chipmunks Songs came out! Just loved it. Now I much tell you, a few weeks ago on The American Movie Classics channel, I watched an old Joan Crawford movie. She lived in a little bungalow just like this (the outside). Wonder if it could be the same outside? I can’t for the life of me remember the name of the movie. Anyway, that’s what I thought of when you showed the first photo. Hope you’re having a wonderful beginning to the Christmas season. .-= Shelia´s last blog ..Martha’s Bloomers =-. I’m so glad you did this post. I LOVE this cottage. The first time I saw it with my daughter, I kept saying “I want to live there” through the entire movie. I know this apartment has been used before in movies (can’t remember which ones though) & I think I remember if from a music video also. OK, now I’m going to have to google this place because it will drive me nuts if I don’t. 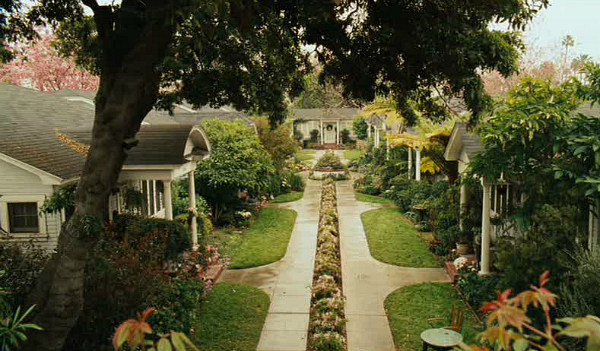 Not a movie I’ve seen, but Oh I love this setting…and the outside, just as sweet! .-= pat´s last blog ..SUNDAY SCRIPTURE =-. I have never seen the movie either. When I first read that you were doing the Alvin Chipmunk cottage, I pictured this ugly cottage, but after seen the pictures, I love it. I love all of the character this cottage has. It’s one I could live in. Such a cute place – worth a download/rental for sure – and I’m in your camp, not sure I would’ve seen it otherwise! What a great cottage! .-= LaurelStreet´s last blog ..Large or small – let me know what you think! =-. This is so great! Thank you for bringing this to my attention…now maybe I will go see the movie when my 6 year old asks! .-= BeachBrights´s last blog ..Cooking Up A Storm with Pioneer Woman =-. What a great cottage……it’s one of my son’s favorite movies! .-= Stephanie @ Geezees´s last blog ..looking for balance, found some … and Cindy Lou Who? =-. Hey, Julia, I’ll be joining your blog party & I hope you’ll join mine! I’ll be adding links to all the ones I know about too. Mine is on Thursday!! Can’t wait for a fun week. .-= Rhoda @ Southern Hospitality´s last blog ..Lime and Red in the Kitchen =-. I must admit that we’ve rented the movie a couple times with our kids, and while it’s not Oscar material, it’s palatable–cute even! .-= Holly´s last blog ..First Weekly Thrifty Gifty Round-up and Linky Party =-. 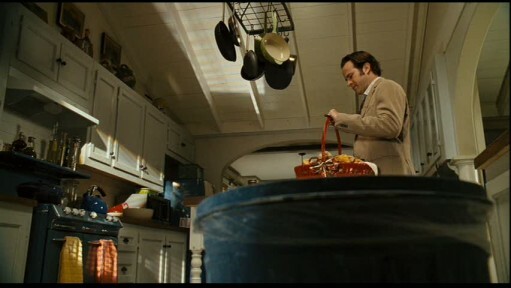 Haven’t seen this movie, but I’m loving the kitchen! What a cute house! .-= micah´s last blog ..Tour de Christmas Lights =-. I think it will be so fun. The commercials are a kick, they make me laugh out loud!! The cottage will be a treat! .-= Art by Karena´s last blog ..Tis the Season…Love the Lights =-. 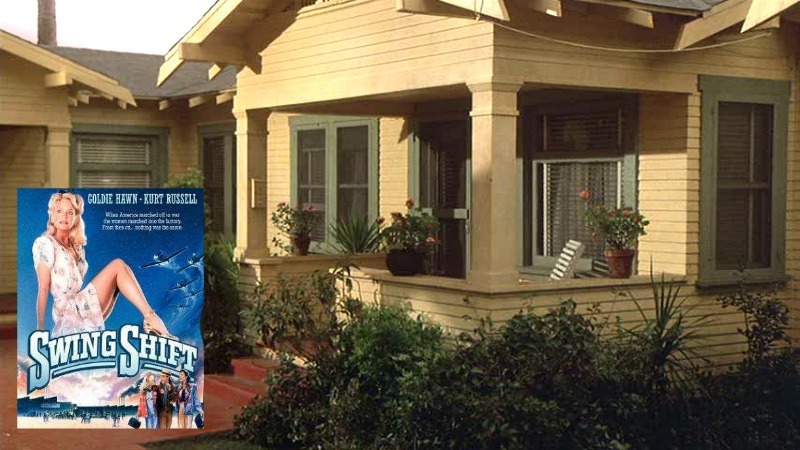 Now I want to rent the movie…just to see the house! So this charming little neighborhood really exists? Cute place! .-= Susan´s last blog ..Welcome to the 47th Metamorphosis Monday and a Give-a-Way! =-. 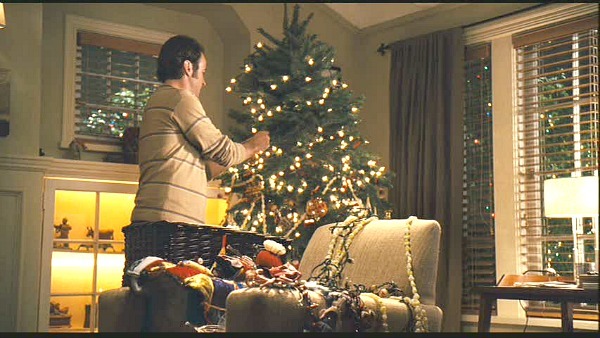 oh yes, lovely home, perhaps a bit tired looking inside, but I guess the set designers were looking for that for a guy! .-= Annie@A View on Design´s last blog ..Sleek Peppermint Grove Style =-. How charming! My son’s one complaint about the world is , “Not enough sidewalks!” He would love this neighborhood. I would LOVE to in a house just like that. I can’t believe it’s a real apartment complex? How fun would it be to live there? Great post Julia! .-= christy´s last blog ..Funky lights =-. This is one of my favorite movie houses. I love it! I swear I am going to pack my camera and hunt down that apartment complex one day soon. Thanks Julia! .-= Janet´s last blog ..Easy Weekend Project =-. I even love the outside of this complex! The kitchen seemed kind of big for an actual home/apartment this size, but the whole thing was set up really cute. What a great house. Wouldn’t mind living in that neighborhood. It is lovely! .-= Christi at A Southern Life´s last blog ..Southern Christmas by the Fire =-. .-= Bailey´s last blog ..A little flow of consciousness… =-. .-= MissCaron´s last blog ..Let it be Christmas … =-. 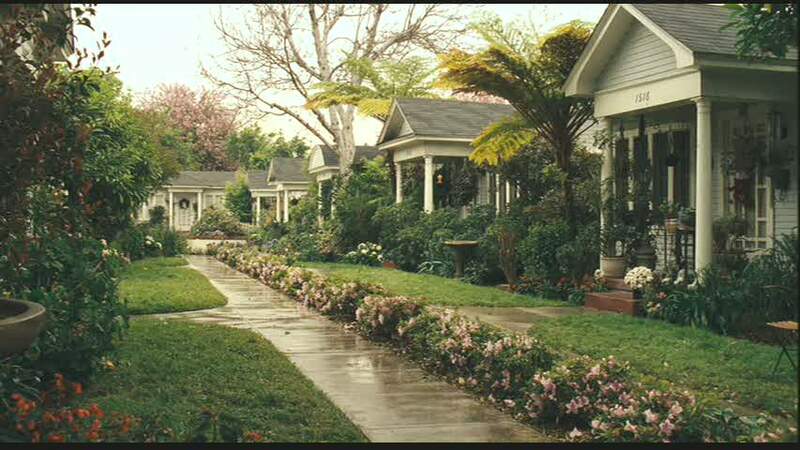 I’ve seen this movie with my kids and keep wondering where they found this cute neighborhood of cottages. Reminded me of watching old shows from the 50’s. Very darling. .-= Melody @ Party Cupcake Ideas´s last blog ..Hello Kitty Birthday Cupcakes =-. 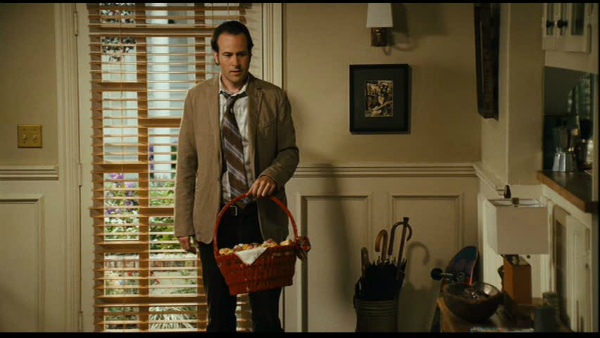 I’ve seen this movie sooooo many times I could almost scream (Indy looooooves it), but I do love that cottage and Jason Lee (it’s weird to see him sans mustache). I want to live there. The kitchen floors are amazing. I’m so glad you did this post. I’m going tohave to watch it one day without Indy so I can pause it so I can look at the cottage. .-= Mom in High Heels´s last blog ..December 7, 1941: A survivors story =-. .-= Amanda @ Serenity Now´s last blog ..Girlie Tree Skirt and Christmas/Blogiversary GIVEAWAY! =-. 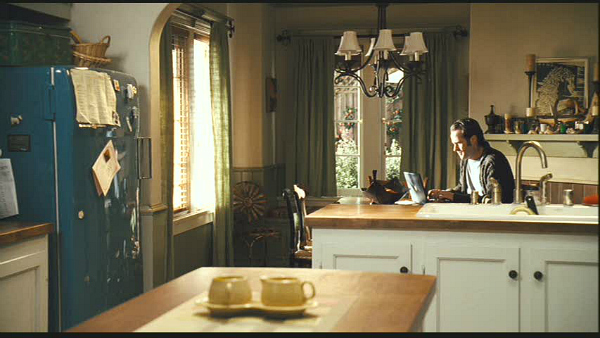 BTW, this isn’t a house in the movie or in real life. It’s an apartment complex. Have you seen “The Ugly Truth?” Katherine Heigl’s character lives in a “cottage/house” that looks something like this from some angles. .-= Joshua Cook´s last blog ..Miles Design Holiday Card(s) =-. It looks so cute! I love it! Congrats on your award, that’s terrific news! Have you thought about doing a post on the house on the new Courtney Cox show Cougartown? I really like her living room! .-= Heather´s last blog ..Happy Holidays-Giveaway =-. Julia- I have not seen the movie, but LOVED the song when I was a kid. I am surprised you wondered about Dave’s house. 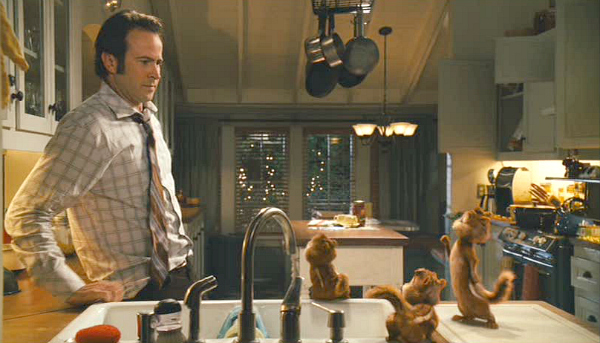 He is not your normal batchelor–living with 3 chipmunks! I especially love that painted floor! I love to hear him scream “Alvin” in the song. What a fun post. I will watch for the sequel! .-= susan´s last blog ..Deck the Halls… =-. It’s too adorable. My kids are grown and my grandbaby is only 4 months old, but I may have to get this on Netflix. An observation about sets: usually the interior sets are much larger than the actual cottage could be judging from the exterior. Love all the interior detailing and windows. That is GORGEOUS!!! I haven’t seen the movie, but I love the house. .-= anna see´s last blog ..2 Dollar Chair Revisited =-. WOW. So glad you posted all of these so I don’t have to see the film, lol… tho I LOVE the chipmonk song, this just looks hokie. I’m sure Nova will want to see it someday tho, so at least the nice home eye candy will make it tolerable! Definately doesn’t look like the home of a straight single man! As soon as I saw the complex I thought of Swing Shift… only those homes were closer together and simpler bungalows if I remember right… I loved the simple 40’s decor in her home on that movie too. Hi! I wrote you earlier about this house! I am sooo super happy you got pictures! Thanks for sharing! Last night we watched The Ugly Truth. 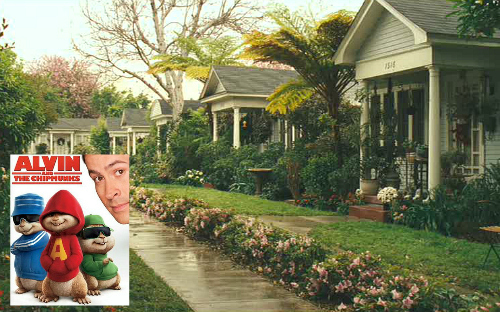 The neighborhood seemed very much identical to he The Chipmunk Movie neighborhood. I would not be surprised if it was the same place. .-= Melissa Martin´s last blog ..Really? =-. I’ve never seen Swing Shift but I’ve read in a couple of different places that people think they might have used the same place to film. I found on another blog that for Swing Shift, they filmed at the “Grand Cottages, 9th St., Sunken City” (San Pedro). This is funny as we just watched this movie two nights ago for the first time. I was just home decor surfing and ended up here from another blog not even looking for this stuff. I loved that house too but want to know more about the photographs on the walls in the house! Who is the photographer, etc.!! What a cool site you have here. Thank you so much for this website. I went out and googled for the houses in Alvin and the Chipmunks movie and I found this website. This is wonderful. 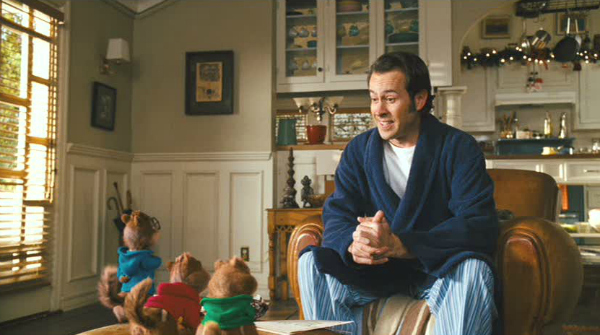 I have seen the first Alvin and the Chipmunks and the Squeakwul. I could not get these cottages out of my head the first time around and was pleased to find them in the second. I would LOVE to have a house like this. The built-ins and the window in the bedroom really caught my attention. Wish I could live someplace this unique. I LOVE your website. FYI – Ross Bagdasarian plays the songwriter that lives across the courtyard from James Stewart’s apartment in “Rear Window”. That set also fascinates me – maybe not a house, but perhaps you could add a post about it someday. I love that house! It was the best part of the movie and now I found someone who shares my passion. You’re awesome! What a fun website and great way to get house-lovers everywhere involved in the ‘action’. Great post by the way… everyone agrees this cottage should be made available for us fans out there! .-= Hailey´s last blog ..60 Days to Triathlon- Day 17 =-. I have been all over the Internet, trying to find out where this development is, because I know I’ve seen it before. And not just in the first Chipmunks movie. How lucky are the people who were able to secure a spot there??? .-= Mom of Three´s last blog ..Our Pet Zone. =-. Are these the same cottages that “Swing Shift” Goldie Hawn lived in? Several readers have commented that they were the same, so they could be. However, I just watched “Swing Shift” and although the bungalows were similar, that complex was much smaller, and the houses were closer together. I found a blog post written by someone who says she lives in the bungalow used in “Swing Shift,” and she mentions that it was built in 1929 (these were built in 1919). You can read her blog post here: https://juliegoestohollywood.blogspot.com/2005/07/my-little-hollywood-bungalow.html. What an amazing renovation! And neat story. I can’t think of anything better than seeing an amazing historic neighborhood saved than it helping those really in need! Thanks for sharing this because I bet a lot of readers didn’t see this movie. .-= Karrie´s last blog ..Peonies Around the Pad =-. Wow! Those are gorgeous! I loved the built-ins! Another beautiful house & yard. .-= Jay Chua´s last blog ..Atlantic Outdoor Iron Patio Double Glider =-. How did you ever find this out? I looked all over for this info! I am thrilled that you did this! I know I mentioned it awhile ago and finding anything about it online is difficult! I love watching it if just for the house! I have seen this community from the sidewalk and it is marvelous! Seeing this today tickled me so!! Thank you dear heart! .-= Susie Q´s last blog ..Where Did That Week Go? =-. I love this house. I was wondering if you have ever considered the house from the movie Practical Magic? …the front door, a staggered wood and glass oriental inspired piece? Was this a custom door? I’ve never seen another like it. Thanks for the the great story. Please consider doing a feature on the villa in the film I Am Love, starring Tilda Swinton. It’s amazing. Love your blog; thank you! 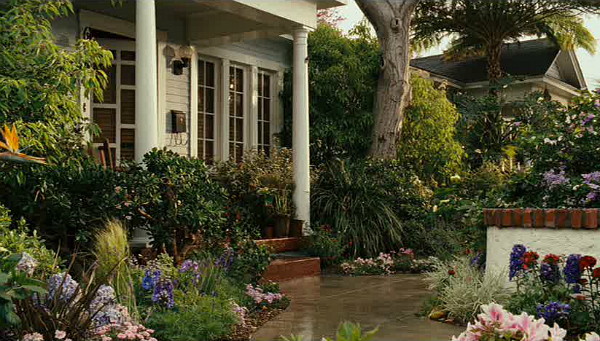 This is a beautiful home, I wish you would feature another kid’s movie house Marmaduke. They go from small town country farm house, to big city digs. The houses are both charming.Thank you. I am hooked ! I would love to know the paint colors used in the interior of the cottage. The walls, the cabinets and the bathroom especially! Is there any way of finding out what colors they used? And then letting me know? Thanks! I love this house! I was searching for another house and found this site. 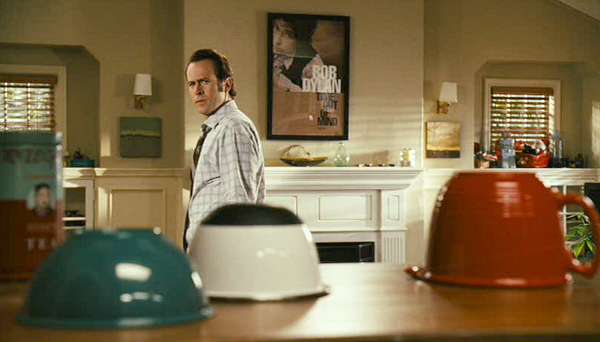 I really want to see pictures of the boys bedroom on I love you, Beth Cooper. I just loved it. The movie…eh…but the bedroom, yes! It’s exaclty how I would love to do my boys’ rooms! Just had to comment, even thought it’s been a while since you posted this. 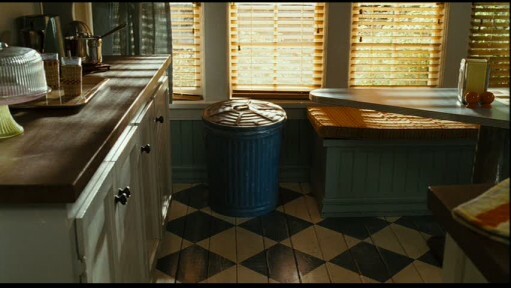 Oooohhhh, LOVE the painted floor in the kitchen and the wainscotting in the bathroom! Such an adorable cottage! You know, I think I’m addicted to your site! I’m Hooked on Hooked on Houses! 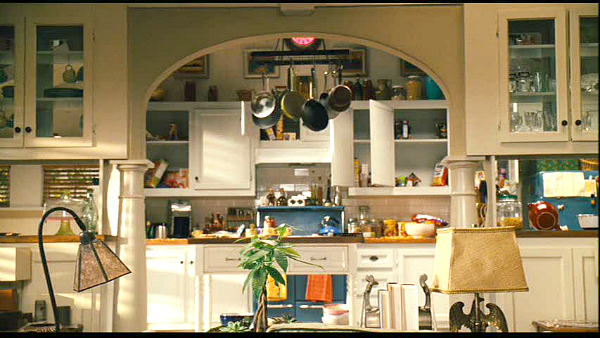 Hi, thank you so much for your post…..i watched this show the other day with my kids and saw the shelf above the cooktop. I’ve never seen that before. Can you tell me what it is called?